I finished the sculptural vessel on the sixth day without bothering to tackle the tight twisted areas. I only added a row or two more and decided it was time to finish off the vessel. All in all….I really ended up liking the completed project. Were there things I wish I had done differently? You bet. But, I am always way too critical of my own works. I see all the imperfections (in my mind) and wish I could go back with some “do overs”. But….this is the journey…..and this is how I learn from project to project. Will I make the same “mistakes” on the next one? Or will I take what I learned while making this vessel and try to improve on the next? To me….this is what creativity is all about. The more we do…..the more we challenge ourselves….the better we get. Or at least I hope that is the case. I hope you’ve enjoyed “being inside my mind” as this vessel came to be. As I move thru the various stages of making a basket or sculptural vessel my feelings about the project vary greatly from day to day. I thought it might be interesting, especially for newbies, to follow along “inside my head” as this vessel progresses. 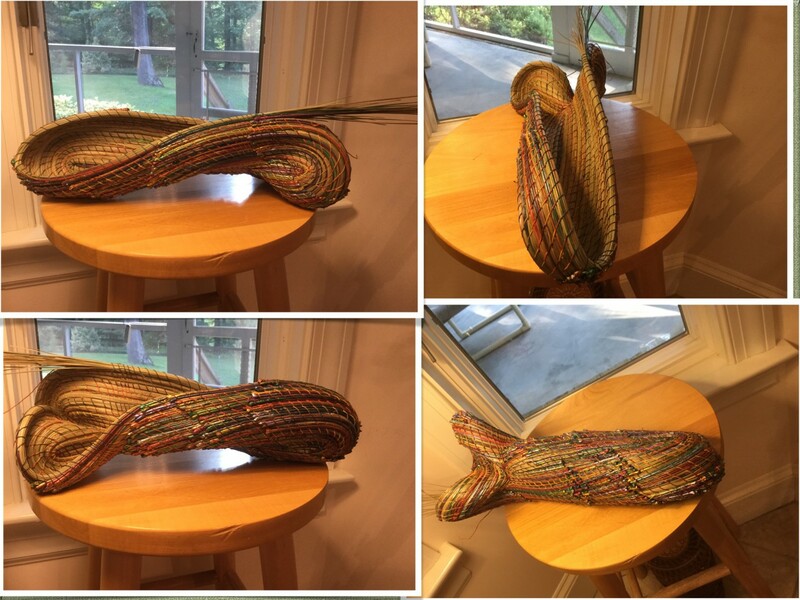 I’ve been working on this project for several days already but I think I can back up and share the thoughts I had as the basket got to its present stage. During my first sitting, I got 3 1/2 revolutions of coils done. Starting a new vessel is always exciting and I was particularly pleased with the colors. Since I didn’t have a finished project in mind, I wasn’t sure about how many capped end segments to initiate in these first coils. I decided on three and figured I’d just see where that took me. I didn’t pay attention to the time involved, but I guess this is a couple of hours or slightly less. The second sitting added three more coils along with the protruding tails at one end. So…now…I’m not quite as thrilled with this. I really don’t care much for how the tails are shaping up. I need to place some additional capped ends on the tails and more decisions arise as to where they should initiate. Well, let’s just plunk them down in the middle of the tails and hope for the best. I’m still not crazy about the shape it is taking, but I still have no vision of where I will go with it. I’m about 5-6 hours invested so, I just keep coiling, adding needles and placing the caps along the lines I initially started. I’m hoping beyond all hope that I’m going to like this one….at least a little bit….because I’m too far in to quit now. 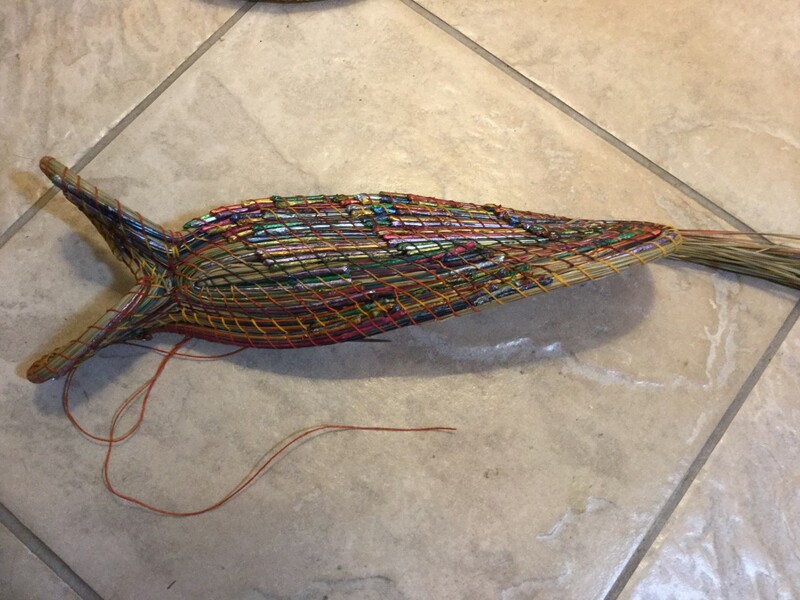 Or….maybe I should end it now and make it a weird wall hanging!!! Well, let’s put it down for now and come back another day. I seem to be stuck on adding three coils at a time. The third sitting takes me to nine coils and another 4 hours or so invested. I’m getting lukewarm about this as some shape begins to emerge. But I’m still not happy about those tails. And I still don’t have a vision of the final product. The next sitting on the fourth day, was not very productive. Only spent a hour or so and finished a little over one more coil. Not a lot of progress visible from the day before, so I’m still very much lukewarm about how it’s shaping up. I’m really starting to get discouraged about the whole project. I’ve got upwards of 10 hours invested, maybe more, and I’m definitely NOT loving it. Ten hours is a lot of time to do something and not be totally thrilled with what you see. But persistence is all I have, so I keep going. Today is Day 5 and I worked on this for about another 4 hours…..closing in on 15 total hours or more now. There are a total of 13 1/2 revolutions. I wish that more of the natural green needles would show but the placement of the capped ends are too close together. Maybe as I go higher up….if there’s room….the green will show up more. beginning to curve upward, so I guess this will become an oblong boat-like vessel. But I still need to figure out those twists. Maybe a window with the fagot stitch. Or a window with some sort of cool bead or stone. Let’s go plunder through the bead boxes and see what emerges. Well, maybe not tonight….maybe I’ll do that tomorrow. Maybe tomorrow I’ll also wake up and really like this one a lot more. I must keep telling myself…..it’s the journey! It’s cool enough this morning to do some needle prep work in the “garage studio”. 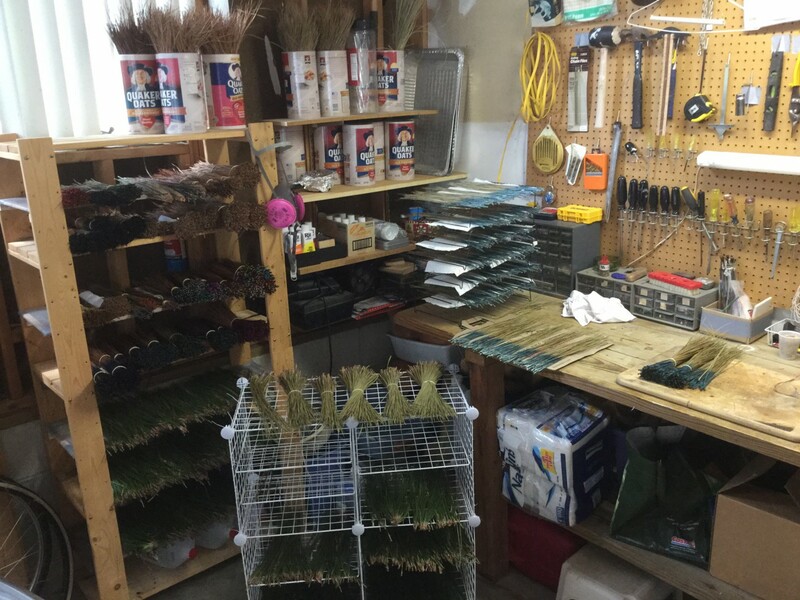 Got needles in various stages of readiness…..fresh green needles drying out……dried green and brown needles waiting to be dyed……needles being dyed…..dyed needles waiting on paint…..painted needles drying on racks…..and finished needles neatly bundled and stored. Life is good! 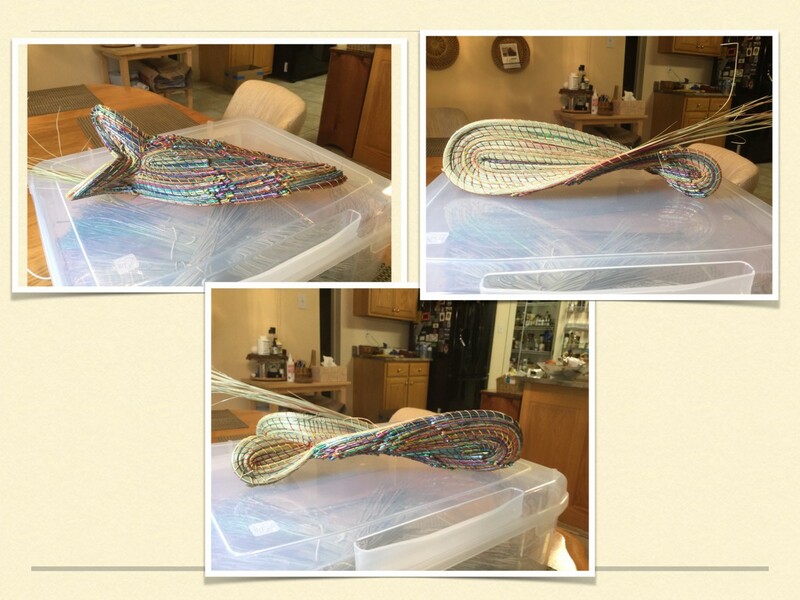 Now….back inside to actually work on a basket! I would be much amiss if I didn’t give a shout out to my Crazy Coiling Buddies in one of my first blog posts. This fantastic group of ladies….ALL of whom I’ve taught to coil….are simply the greatest friends a woman could have. We meet about once a month to coil….sometimes do other projects…to eat, and just to have fun and laugh. Who could have dreamed retirement could be any better? 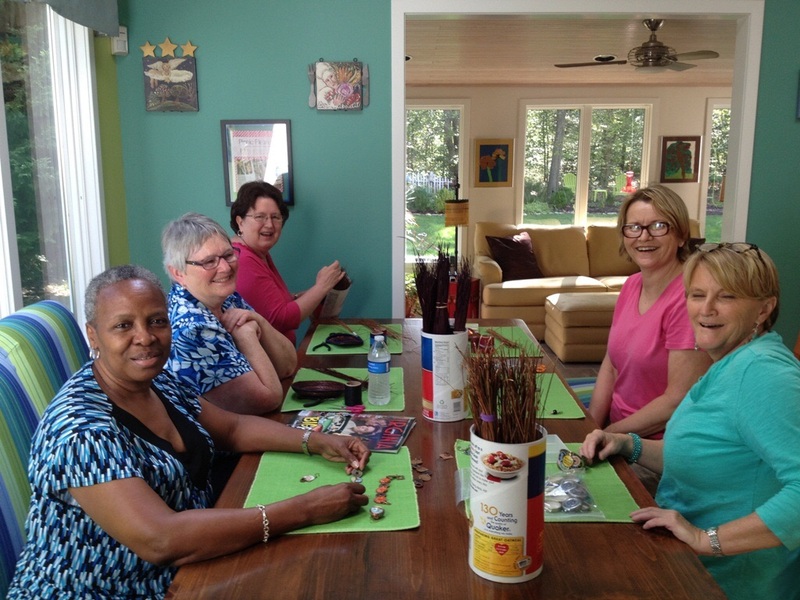 L to R: Georgette Bailey, Ronda Lachine, Pam Jones, Lou Stafford and Linda Brule. I’m taking the pic, so I’m missing! Whoopeee!!! I’m ready for the first guests to my website and blog. There may still be a few kinks to work out, but I won’t know what or where they are until the guests arrive! Hope you enjoy the site. 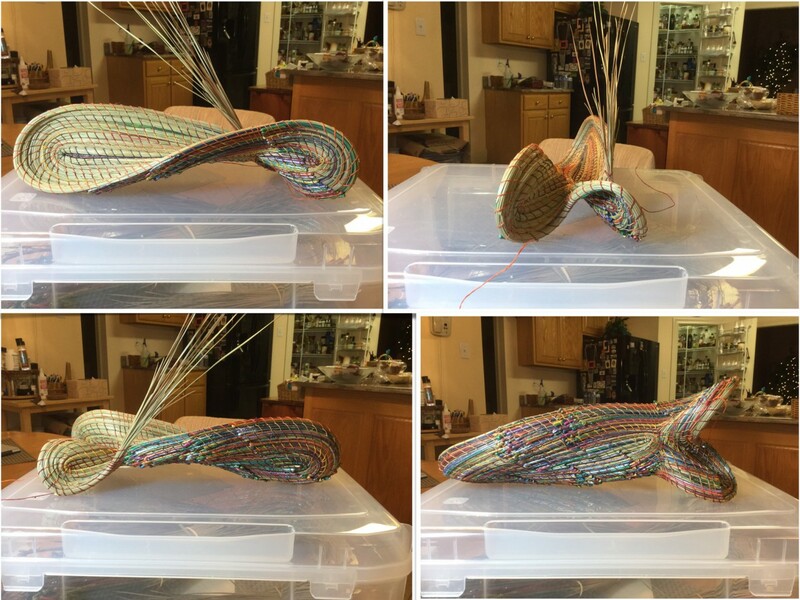 I’ve never written a blog, but, like everything in coiling…..there’s always a first time. So, I’m “up and running”. Catch me if you can.